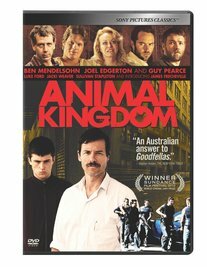 OVERVIEW: Sony Pictures Home Entertainment is pleased to announce the release of the explosively entertaining crime drama ANIMAL KINGDOM on Blu-ray and DVD this January 18, 2011. Winner of the 2010 Sundance Film Festival Award for World Cinema (Dramatic) and nominated for a record-breaking eighteen 2010 Australian Film Institute Awards, this searing portrait of a young man caught up in Australia’s criminal underworld has received unanimous praise from critics for its riveting direction by debut filmmaker David Michôd and gritty acting by a top-notch cast that includes Guy Pearce (The Hurt Locker, Memento), Joel Edgerton (Star Wars Episodes II & III), Luke Ford (The Mummy: Tomb of the Dragon Emperor), Ben Mendelsohn (Australia, The New World) and, in one of the year’s most talked about performances, Jacki Weaver (Cosi, Picnic at Hanging Rock) as “one of the most diabolical mothers in cinematic history” (Roger Friedman, Showbiz411.com). ANIMAL KINGDOM is now poised to expand its reign of crime drama suspense and thrills on Blu-ray and DVD, featuring hours of revealing bonus features fans won’t want to miss. Bonus features on the ANIMAL KINGDOM Blu-ray and DVD include audio commentary with Writer/Director David Michôd, the behind-the-scenes featurette “The Making of Animal Kingdom” (exclusive to the DVD), a Q&A with David Michôd and stars Jacki Weaver and James Frecheville and “Creating Animal Kingdom” (exclusive to the Blu-ray). SYNOPSIS: When his mother dies from a heroin overdose, 17-year-old Josh Cody (Frecheville) is taken in by his grandmother (Weaver) and uncles, the most notorious criminal gang in the city. So when tensions between the Codys and a squad of renegade cops land him at the center of a cold-blooded murder plot, Josh is forced to choose between his treacherous family and the lawless police in this shattering thriller. DVD: The film is presented in widescreen with a 2.40:1 aspect ration preserving its theatrical format. Sony Pictures Home Entertainment has done it again with this transfer. Not only the picture looks excellent in this release, also the sound it is good. A Dolby Digital English, Spanish and French 5.1 Surround providing a nice complement to the picture it also includes English and Spanish subtitles.